Here at Zitec, we all strive to do our work at the highest professional standards. Constant improvement, innovation, expanding our knowledge and skills are not just fancy words, but a must have. Every day we must deal with the usual problems: time constraints, criticism, managing the client’s expectations, interpreting their wishes and the list can go on. Over the years, we learned that following solid values and principles helped us doing an excellent job. 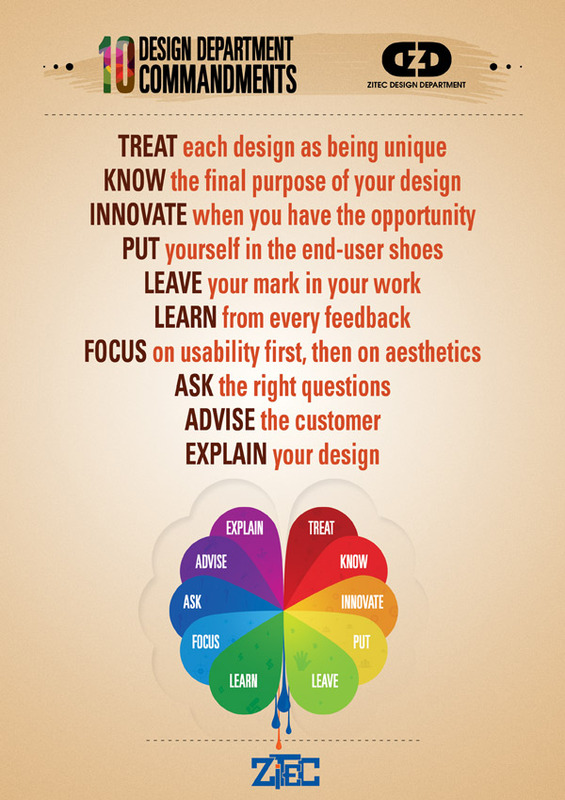 Today I would like to share with you the 10 Commandments of our Design Department. Everybody wants their project to look “clean, business, professional and easy to use“. But every design is unique and we must find that particular “something”. We always do our best to not reuse graphic elements and to not follow the same patterns, even though some design briefs are very similar. Whether we work on a mobile interface, a complex back-end or a Drupal front-end theme, we always have a very clear picture of the final goal of the design. Without it, we would overlook important details and create a less than excellent user experience. Yes, we can’t do this all the time. There are design rules and standards, there are brand manuals and sometimes precise design specifications and we also shouldn’t reinvent the wheel. But when we are assigned with “that project” everybody dreams of, that allows us to unleash our full creativity, we always take the opportunity and give our best. Sometimes we need to take a step back, take a break, clear our mind and put ourselves in the end-user shoes. When we’ll see our design again, it’s always amazing how many improvement ideas will pop out. We all have our sources of inspiration, we all use the free graphic resources like icons, patterns, textures, brushes, you name it. If I would need a concrete wall background I would surely Google it first and not grab my camera and go out. But the final design must be original. We must add our magic dust on every piece of our work. • Turn negative feedback into constructive one. A good looking design doesn’t necessarily make it easy to use. A user could say “wow, this looks very nice!”, but then would not know where to click next. He will click the close button instead, because users appreciate functionality over looks. So usability and utility comes first, but this doesn’t mean that we won’t be taking good care of the artistic part. We don’t always know the goal of our design or if the client has a preferred color scheme or a company motto. We need to always ask all the questions, in order to create the best user experience and to satisfy our customer. Usually our clients don’t have our professional experience, otherwise they wouldn’t be hiring us in the first place. We are not expecting them to know that it’s not a good idea to place banner ads in the checkout process or to endless add new items in the main menu. We continuously advise them about the best option and, together, we always come up with the best solution. Our design may be excellent and extremely usable, but the client doesn’t always understand what we did. So we should always explain and detail our ideas and design, in concise and easily understandable way. Pure CSS Logos. No Images, No JS. Foarte bun articolul, se observa vocea experientei. Mult succes in continuare!